Hirosaki's Sakura Matsuri is the most popular of all the Cherry Blossom activities in the northern portion of Honshu. 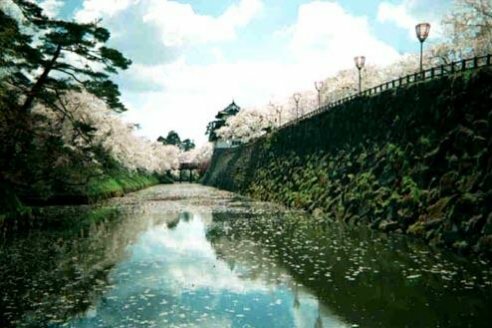 While you can find sakura in just about any park in the area, the trip to Hirosaki is a "Must Do" before you leave Misawa. It is held each year around the end of April. The date varies, based on the weather patterns. Usually, the best time is usually around the last weekend in April. The festival is held on the grounds of the midieval Hirosaki Castle. There are over 5,000 Cherry Blossom Trees on the grounds. Misawa ITT has tours and there are usually other tours available. Sakura is the actual cherry blossom flower. Matsuri is the word for festival. You will also hear this referred to as Hanami. This term means "flower viewing". So Sakura Matsuri is the event and Hanami is the activity of participating in the event and enjoying the beauty of the blossoms. If you can't make to Hirosaki, you can always take in the beauty of these flowering trees right here in Misawa and the surrounding area. Cherry trees are in abundance both on and off base. One of the most popular spots is the Misawa Central Park (Chuo Koen). It's also known as the Train Park and is located next to the Civic Center. Just head out the main gate and proceed staight through the second traffic light. Through that intersection, the Civic Center is on the left and the park is just beyond it. It's less than a 10 minute stroll. Shimoda Park in Oirase Town is home to hundreds of cherry trees here and there is ample space to walk around and take in the sights of spring time in Japan. For those who would rather have a bird's eye view, there is also an observation tower on top of the hill. You can also enjoy watching birds at Magi pond although nearly all the swans have left to go north for their summer breeding. There will be various other activities held throughout the week at the park as well. Ichou Park will be hosting Japan's #1 Statue of Liberty and Cherry Blossom Festival as well. Here is your chance to get a good look at a piece of America right here in Aomori while taking in the glorious cherry blossoms. The Statue of Liberty replica was built to associate the former town of Momoishi with New York City as they both share the same latitude. Built to 1/4 the scale of the original statue, this fiberglass replica is beautifully illuminated at night. Directions To Ichou park. From the main gate: Turn left and continue straight to Route 338 about 6 km. Turn right at this T intersection and follow the main road into Oirase Town. After going past the Junior High School on the right hand side of the road, continue on and another kilometer on you'll go down a bit of a hill and see an intersection with a Lawson convenience store on the left. Turn left at this light and after another 0.4 km the park entrance is on the left. Turn down this road and after passing through the orange arch take the left branch of the road and follow the road around and you'll be able to find a park. To Shimoda Park. Go out the Main Gate turn left then take the first right. Follow this road down past the church and turn right onto Route 10 at the Lawson convenience store. Or go out the POL gate and just drive straight down Route 10. Then continuing on Route 10, go past the "Universe" Supermarket and past the "Netz" Car Dealer, on until you see a "Circle K" convenience store at the traffic lights on the right and a Dainamu Pachinko Parlor on the left. Turn left at this light onto Route 8. Follow the road past Kehi Shrine and past the cemetery at the lights. After going under the Momoishi Toll Road take the left at the next light opposite a car sales yard and follow the road past the farm until the next intersection. Turn right here and after about 2 kilometers you'll see the park on the right. Pack a picnic lunch and some drinks and head out to Central Park or any of the other small parks that dot the city. Don't forget a blanket to sit on.